Attorneys for Chicago police Officer Jason Van Dyke argue that “blatantly prejudicial” and “inflammatory” media coverage has saturated Cook County, creating what they believe could be the most “compelling example” of the need for a change of trial venue in history. In a newly unsealed motion made public Thursday, defense attorney Daniel Herbert says sensationalized media coverage across the area over the past two-plus years has made it impossible for his client to get a fair trial before a Cook County jury. Van Dyke has been charged with first-degree murder in the shooting death of teenager Laquan McDonald, who was shot 16 times as he walked along a Southwest Side road carrying a knife in October 2014. In order to move a case to a new jurisdiction, attorneys must show that media coverage of the crime is so overwhelming that potential jurors are incapable of avoiding its reach. These types of motions aren’t uncommon in high-profile cases like this, but they are rarely granted. In the motion, Herbert points to the publishing of dash cam footage of the shooting itself – which he says has been viewed more than 4 million times on YouTube alone – and a LexisNexis search using the terms “Laquan McDonald” and “Jason Van Dyke,” which turned up more than 7,000 publications in Illinois. He says this publicity has been highly critical of his client, referring to the “public execution” of Van Dyke by politicians like Mayor Rahm Emanuel and former Cook County State’s Attorney Anita Alvarez. The motion refers to several news articles in which Emanuel refers to the shooting as “hideous” and says Van Dyke “had no justification” to shoot McDonald. Herbert also assails Alvarez, who first brought charges in this case back in 2015, saying she used that announcement as a platform to promote her unsuccessful re-election bid. Beyond those two, Herbert’s motion mentions comments from city aldermen, Rev. Michael Pfleger, Rev. Jesse Jackson and a handful of reporters and columnists which Herbert argues only fanned the flames of pretrial publicity and highlighted materials that would be inadmissible at trial. As a result, Herbert said his client has been subjected to “violence, intimidation and threats.” Van Dyke is regularly escorted to and from his pretrial hearings by Cook County sheriff’s deputies and dons a bulletproof vest as he enters and leaves the courthouse. “While this court has put in place a system to enhance Mr. Van Dyke’s personal safety, the conduct of the public directed to Mr. Van Dyke shows the public’s bias and prejudice in this matter,” the motion states. A trial date has still not been set in the case, though Gaughan has said he is aiming for a summer trial. Herbert has also contracted California-based trial consultant Bryan Edelman to survey Cook County residents and determine whether a fair jury can be chosen locally. The results of that survey are expected to be finalized early next month. The defense motion was initially filed with the court on March 28, but had been withheld from public view until Thursday as part of a decorum order put in place by Gaughan. But the state Supreme Court struck down that order earlier this year after media representatives petitioned for greater public access to case filings. 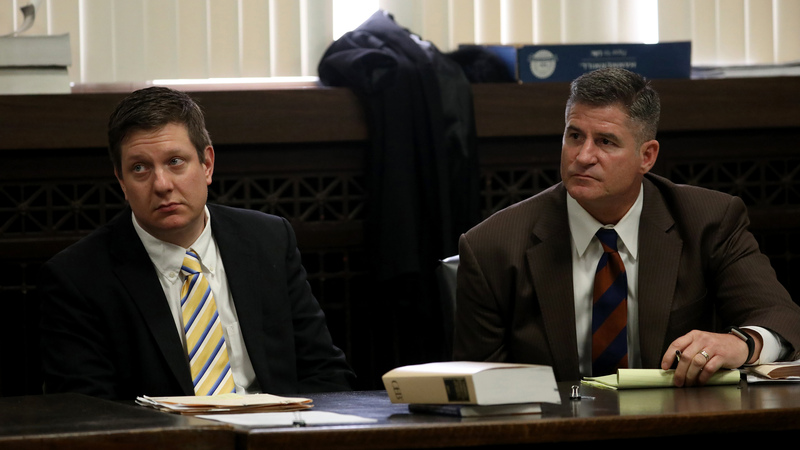 Van Dyke and his attorneys were in court Thursday for a hearing to discuss what questions would be included on a questionnaire distributed to potential jurors during jury selection. That discussion was held out of public view in Gaughan’s chambers and the questions will remain under seal. All parties are due back in court for another hearing Friday to discuss motions made by Chicago Public Media attorneys. That hearing is closed to extended media coverage.